Summary: While risotto purists may decry our calling this a rissoto recipe, it's certainly close enough, and it's vegan, gluten-free, easy, and delicious! 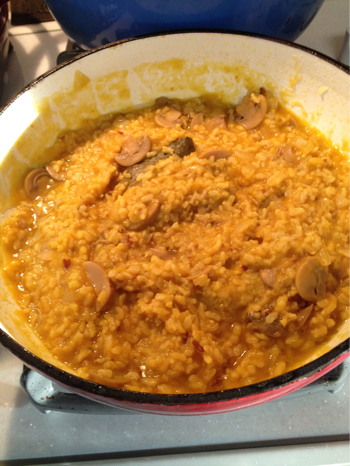 What more could you ask from a vegan brown rice pumpkin mushroom risotto? While risotto purists may decry our calling this a risotto recipe, it’s certainly close enough, and it’s vegan, gluten-free, easy, and delicious! What more could you ask from a vegan brown rice pumpkin mushroom risotto? Stir the stock and the pumpkin together until well mixed, and set aside. In a medium to large heavy-bottomed pot (we use our 3 quart enameled dutch oven for this, in fact we use our enameled dutch ovens for almost everything!) heat the olive oil over medium heat. Add the chopped onions and cook, stirring occasionally, until softened and translucent. Add the brown rice to the pot, and stir, coating the rice with oil. Toast the rice, stirring frequently, for another three or four minutes. Stir the pumpkin and stock mixture into the pot, and stir well. Add the mushrooms, salt and pepper to taste, and the bay leaf, and bring to a boil. Reduce to low heat – just high enough to maintain a gentle simmer – and cover. Cook for 45 to 55 minutes, stirring every 10 minutes or so to keep the rice from sticking to the bottom, and replacing the cover immediately after stirring. When nearly all of the liquid is absorbed, remove from heat and let sit, covered, for 10 minutes.